the most successful codes ever used. It remained unbroken throughout the course of the war. The Navajo code was not the first attempt to use Native American languages to disguise military communications. During World War I, the military adopted the Choctaw language as a code and employed Choctaw code talkers. Indigenous languages attracted code experts because most had no systems of writing and were spoken by a small number of people. The first attempts to utilize Indian languages as code simply involved using the spoken language and translating the messages into English. The language itself functioned as the code, and no additional encryption methods were employed to encipher communications. In 1939, as World War II began in Europe, the American Army Signal Corps and Naval Intelligence renewed their interest in developing sophisticated enciphering methods. Both Allied and Axis forces relied on new cipher machines and complex mathematical encryption tables for encoding messages. Intelligence service cryptologists broke many of these, such as the German Enigma machine. Codebooks were risky, and too easily recovered by enemy forces. These developments forced cryptologists to change codes often, requiring tedious work. Code experts sought a code that would be simple to use, functional, and secure for the duration of the war. World War I veteran and civil engineer Philip Johnston proposed the use of a Native American language in conjunction with a letter-symbol replacement encryption system. The son of a missionary, Johnston was raised on a Navajo reservation and spoke the Navajo language fluently. He thought the indigenous language a perfect candidate to use as the basis for a code, largely because of its obscurity. The language had never developed a system of writing, but possessed a great flexibility in its descriptive word combinations. In addition, Navajo men served in cooperation with American forces in World War I, despite tensions during the era between the American government and Indian nations. Military intelligence accepted Johnston's proposal. The project was granted to the Marine Corps for development and supervision. 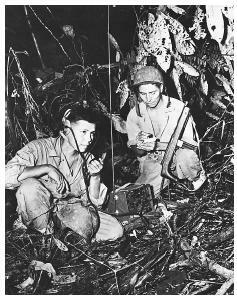 In 1941, the first twenty-nine Navajo code talkers were recruited into service as Marine Corps Radio Operators. The first twenty-nine recruits worked with Johnston and Marine Corps officials to develop the Navajo language-based code eventually used in the Pacific theater of war. The initial draft of the code consisted of 211 key words and military terms. For the names of places and people, the code used Navajo words to spell out proper nouns by taking the first letter of the word's English equivalent. Because several words could be used to represent one letter in the Latin alphabet, the code was flexible for knowledgeable users, but enigmatic to code breakers. The Navajo code talkers also had to invent Navajo words to represent frequently used military terms. For example, because the Navajo had no word for submarine, they used besh-lo , literally meaning "iron fish." Eventually, most radio transmissions were encoded using the word-forletter replacement system. In 1943, Navajo code talker units experimented with overlaying the Navajo code with a mathematical encryption system. While this method was used with great success to guard classified and highly secret wire transmissions, and could be used in conjunction with cipher machines, the process was too tedious for rapid, battlefield communication. After months of developing a functional code, the original Navajo code talkers reported for basic training at Camp Elliot, California, in May 1942. Three months later, on August 7, twenty-seven code talkers, designated the 382nd Platoon, departed for their first assignment among the invasion forces at Guadalcanal. The code was used during the battle with great success. Commanding officers complained that other ciphered messages took two hours to send and decode. The Navajo code efficiently transmitted communications in mere minutes. After the battle, the Marine Corps established a radio and wire transmission station for the Pacific fleet. Within weeks, use of the Navajo code increased, eventually encompassing a quarter of all communications sent from the station. The Navajo code also became the cryptological method of choice for urgent communications on the front lines. Realizing the need for more personnel skilled in the Navajo language and trained for code talking, the military founded the Navajo Code Talkers Program at Camp Pendleton, California. There, Navajo recruits memorized the complex code, and completed specialized equipment training. Over 540 Navajo served in the Marines during World War II, nearly 300 served in the field as code and communication experts. Navajo code talkers operated in all six Marine divisions, and served in every major Pacific battle between 1942 and 1945. At the battle of Iwo Jima, a small unit of six Navajo code talkers, under the command of 5th Marine Division signal officer, Major Howard Connor, transmitted and received nearly 1,000 messages in 48 hours. The unit garnered a reputation for working ceaselessly, and without error. The security of the Navajo code, in conjunction with the work of American cryptologists who broke several important Japanese codes, gave the Allied forces a decisive intelligence advantage in the Pacific. Johnston's code was as functional and unbreakable as he originally asserted. The code not only remained uncracked throughout the course of World War II, but also was used in the Korean and Vietnam Wars with similar success. Other indigenous languages, such as those of the Choctaw, Chippewa, Creek, Sioux, and other tribes, were explored as possible sources for military codes both before and after World War II. However, none were more widely used or accomplished than the Navajo code. The code was eventually retired from use and declassified in 1968. On July 26, 2001, Congress awarded the Congressional Gold Medal to the original twenty-nine Navajo code talkers who aided in the development in the code. The remaining veteran Windtalkers were awarded the Congressional Silver Medal. Bixler, Margaret T. Winds of Freedom: The Story of the Navajo Code Talkers of World War II. Darien, CT: Two Bytes Publishing Company, 1992. Kawano, Kenji. Warriors: Navajo Code Talkers. Flagstaff, AZ: Northland, 1990. Watson, Bruce. "Navajo Code Talkers: A Few Good Men." Smithsonian. 24, no. 5, August 1993. They weren't just helping "us"--they were Americans, too.